First of all thanks for your interest in my work! If you’re looking for a custom illustration, a wedding invitation design, a birthday card, a portrait, an ex-libris or any kind of tailor-made illustration, write me, I will be more than happy to work with you to put on paper your ideas. If you are looking for postcards and posters, you can pay a visit to my Etsy shop. 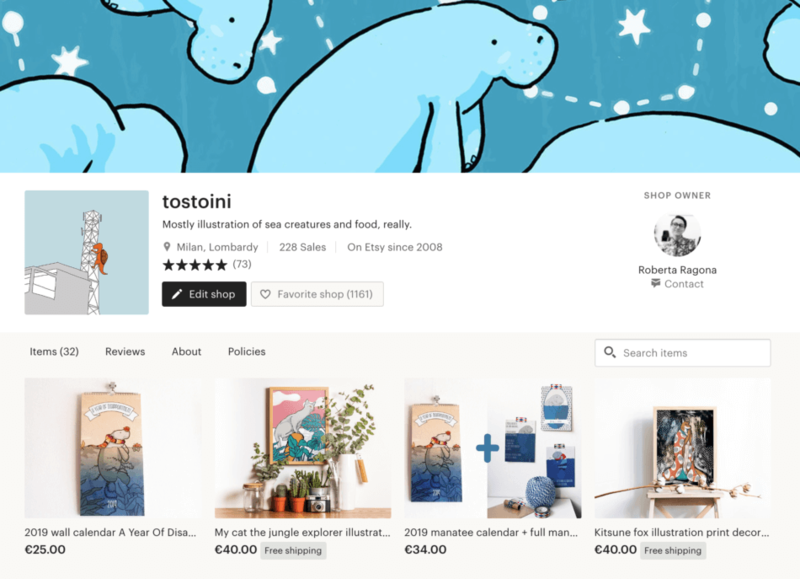 At this moment it’s mainly illustration in postcard format and posters, but in the upcoming months I will add more products, as pattern pendant necklaces, fabric buttons and brooches, t-shirts for adults and kids alike, temporary tattoos and enamel pins. There are plenty of other products I would like to make, but I live in a tiny house so I can’t manage a big inventory, and that’s why I’m on Threadless. There you can really go crazy on stuff with my silly creatures on it: from apparel to home decor, laptop sleeves, iphone cases, mugs, pillows, clocks, stationery, bags, wall art, you name it. If you’d like to have new stuff every month designed for you and an handful of other happy people, you can become a patron on my Patreon page! My patrons gets a new lamentino illustration every month, a newly designed Lamentino postcard every other months, discounts on my Etsy Shop, pins, magnets, temporary tattoos, lots of silly stuff based on that month’s illustration. You can find more details here. If you’re into sewing, designing clothes and everything even remotely related to fabric, I’m also on Colorsoup, a marketplace devoted to all things fabric. I publish there all my new pattern designs and surface designs. If you’re interest in working with me on a new design just for your collection: write me, I will be more happy to put on fabric your ideas! And finally, I’m also on Minty, the commissioning tool and distribution channel for imagery and patterns for professional artbuyers and artists.